Reykjavík is the place to be for those with an interest in the world of arts and culture. It is home to the majority of our most prestigious cultural institutions and talented performers and artists. 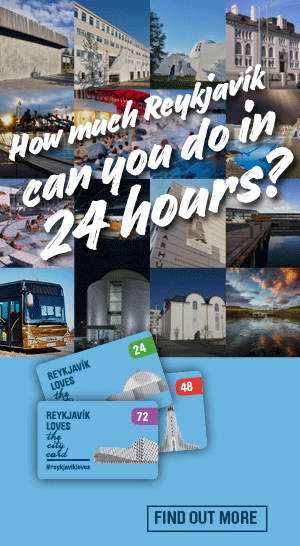 By purchasing a Reykjavík City Card you are granted free entrance to all the main museums and galleries in the capital. Compiled below are various museums, art performances, galleries and cinemas. The Gerdasafn museum was founded in the memory of sculptor Gerdur Helgadóttir (b. 1928), a pioneer of modern sculpture in Iceland. The museum was formally opened in May 1988, after Dr. Sverrir Magnússon and his wife Ingibjörg Sigurjónsdóttir laid the foundation for Hafnarborg by donating their considerable collection of art and their house in the centre of Hafnarfjördur. An impressive Viking-age longhouse from the Settlement period (AD 870-930) until the twelfth century. The National Film Archive of Iceland collects, documents and displays Icelandic film history. The collection consists of Icelandic notes and coin, foreign money from earlier times, especially that mentioned in Icelandic sources, and more recent currency from Iceland's main trading partner countries. Devoted to modern art, both Icelandic and international. Permanent exhibition of works by Jóhannes S. Kjarval, one of Iceland's most beloved painters. A harbour museum exploring Iceland’s dramatic relationship with the sea. The Sigurjón Ólafsson Museum is dedicated to exhibiting works by the Icelandic sculptor, Sigurjón Ólafsson. The Punk Museum is a small museum with a big attitude. Drop by and step into this very creative period of the Icelandic music scene. Whether your visit to Iceland is for business or pleasure, making time for a trip to the National Museum will leave you fully enlightened about the making of the Icelandic nation and its history. Ásgrimur Jónsson (1876 - 1958) was one of the pioneers of Icelandic art and the first Icelander to take up painting professionally. The Einar Jónsson Museum was officially opened on Midsummer's Day in 1923. This was a watershed event for Icelandic art, as the building was the country's first art museum. Gljúfrasteinn was the home and workplace of Halldór Laxness (winner of the Nobel Prize for Literature in 1955) and his family for more than half a century. The Museum of Hafnarfjördur is a museum of cultural artifacts and photographs of the town Hafnarfjördur. The founding charter of the Museum of Design and Applied Art states that the Museum is to collect and preserve the part of Icelandic cultural history encompassing design, especially from the beginning of the 20th century to the present day. For those who are passionate about paintings and other works of art, the National Gallery of Iceland has a wealth of valuable artworks on display, with various exhibitions by both foreign and Icelandic artists. The museum is situated in one of Reykjavík's most impressive buildings, Perlan, and will be a must-visit for any tourist - not only for the world-class museum, but also for its amazing panoramic views of Reykjavík. Reykjavík Art Museum – Ásmundarsafn (Ásmundur Sveinsson Sculpture Museum) is the former home and workshop of the sculptor Ásmundur Sveinsson (1893-1982) who designed and mostly constructed this building himself. Visit exciting photographic exhibitions that focus on contemporary and historical photography in artistic- and cultural context. The Living Art Museum (Nýló) is a museum and a venue for contemporary visual art in Reykjavik. In 2001 archaeological remains were excavated in Adalstræti, which turned out to be the oldest relics of human habitation in Reykjavík! Gerðuberg is an cultural centre offering a diverse program of cultural events for people of all ages. Visit a charming writer-illustrator’s home in the heart of the old town and learn about the history of the city at the dawn of the 20th century. Hannesarholt is a non-profit organization founded by individuals hoping to create a place of nurturing and a reclaiming of cultural roots, in a fast changing society. The National Archives is not a museum in the traditional sense of the word - however, one can access the archives, such as church books and other helpful resources for those interested in genealogy, in the reading room. The Natural History Museum was opened in May 2002. The museum is divided into two categories; geological and zoological. The temporary shows at the museum tend toward the progressive and experimental, emphasizing works from established contemporary artists. A vibrant cultural center in your neighborhood, the Reykjavik City Library invites you to find books, events, knowledge, music, information, humor, films, and visual art. The Saga Museum recreates key moments in Icelandic history, moments that have determined the fate of our people. It gives a compelling insight into the Icelandic way of life for more than a millennium. The Icelandic Phallological Museum is probably the only museum in the world to contain a collection of phallic specimens belonging to all the various types of mammals found in a single country. The Marshall House was built in 1948 as a fish meal factory. After having served its original purpose well, in 2017 the house was re-designed and renovated to be used as a cultural center.